In an attempt to drive up the price of oil, OPEC yesterday announced production cuts of 2.2 billion barrels of oil a day among its member countries. How much did the price of oil increase? Instead, three-month futures for light, sweet crude went down $1.54 to $38.52. Clearly, the cartel is losing its ability to manipulate the price of oil. The question becomes, why? Compliance is certainly one answer: countries which thought they were budgeting conservatively by using an oil price of $70 bbl when the price of oil hovered in the $140 range are already facing severely reduced revenue and cannot afford to reduce production further. Additionally, many of OPEC’s member countries heavily subsidize their economy via their oil revenue: Saudi Arabia’s chief oil man, Abdullah Juma, revealed in a recent 60 Minutes interview that, while it cost the Saudis just $2 per barrel to produce oil, they have a break-even price of $55 per barrel to pay for all their social programs and other government expenses. Likewise, Venezuela and Iran have heavily subsidized their economies, spending lavishly on socialized programs. Reducing production means reduced revenues in the short term, until the impact of the cuts, hopefully, causes a price increase. OPEC also revealed their prior cut of 1.5 billion barrels per day, implemented in October, had only an 85% compliance rate, and in all likelihood that’s overstating things. The current state of the world’s economy plays a major role too: demand for oil is shrinking substantially as economic output decreases – current estimates by JP Morgan forecast a 1 billion barrel a day reduction in demand for 2009. While OPEC tries to find the ideal price point whereby member countries get the highest possible margins without significantly diminishing global demand, that global demand has already evaporated significantly. Lastly, OPEC had hoped Russia would commit to a share in output reductions. Russia decided to pass, probably because they too couldn’t afford to reduce output in the midst of significantly increased government spending on bailouts and revenue shortfalls already hitting the government’s budget hard. The problem OPEC faces now is a credibility gap among the member countries: the levers they’ve for so long pulled to manipulate oil prices are no longer getting the desired results. And that may result in even less compliance, as OPEC members realize cutting production as the price of oil falls further means even less revenue to state coffers. 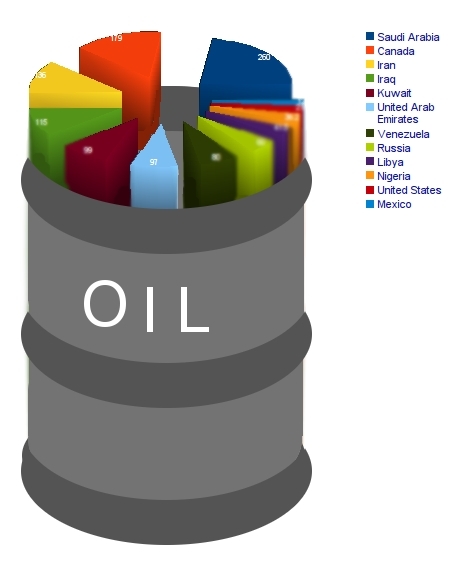 Who has the 2nd Largest Oil Reserves and is the US’ Top Oil Supplier? Which country has the world’s second largest proven oil reserves? Which country does the USA rely on to supply it more oil than any other country? Saudi Arabia? Kuwait? The United Arab Emirates? Here are some more hints: the country in question is a politically stable democracy, enjoys great relations with the US and doesn’t even require a supertanker to get its oil to the world’s biggest customer.